Do you remember when television in Anchorage brought you Christmas and holiday shows two weeks later? When I was a senior at East high school in 1965, I started working at KTVA channel 11. Back then, KENI TV, (now KTUU) and KTVA both received all their shows from the networks on 16mm film. Live network shows were recorded on a "kinoscope" using black and white 16mm film. Hawaii received the film on a one week delay, then sent the film to Anchorage on a two week delay and then the film was shipped to Fairbanks on a three week delay. KENI-TV, channel 2 started broadcasting in color (using a system that let them broadcast 16mm color film), but shows were still on a two week delay. KTVA, channel 11 started broadcasting films in color not long after channel 2. Remember when KENI-TV began broadcasting NBC's "Huntley-Brinkley Report" on the same evening it was broadcast in the lower 48. The Huntley-Brinkley Report was broadcast on NBC from October 29, 1956 to July 31, 1970. And you may remember that at the end of each night's newscast David Brinkley would say "good night Chet" and Chet Huntley would say "good night David and good night from NBC News." Well, back in those days, getting NBC's nightly Huntley-Brinkley Report on the air in Anchorage on the same night it aired in the lower 48 was no easy trick. First, NBC in Burbank recorded the show on a format known as 2 inch videotape, then sent it to Los Angeles International Airport where it was carried into the planes cockpit and flown to then Anchorage International Airport. The 2 inch videotape was then hand carried from the planes cockpit to a waiting taxi driver who then "rushed" the tape to KENI-TV in the basement of the 4th Avenue Theater building. KENI-TV would then air the Huntley-Brinkley Report at 10:00pm followed by 30 minutes of local news, followed by the Tonight Show with Johnny Carson. Things did not always go smoothly and sometimes the tag-team broke down, causing problems for the good folks at channel 2. KTVA followed suit with CBS News and Walter Cronkite. And I can tell you from first hand experience that there were nights when the taxi would show up at KTVA's Broadcast Center in Spenard only moments before the show was scheduled to go on the air. With the addition of videotape, all network shows in Anchorage were now being broadcast in color, but they were still on a two week delay for the lower 48. And because of that, we all got to have our "TV Christmas and holidays", two weeks later. Arrangements were made for the use of a military satellite system and channel 2 and channel 11 both broadcast the lunar landing live. So Anchorage got to see and here "that's one small step for man and one giant leap for mankind" at the same time everyone in the lower 48 did. As you might imagine, all three television networks, ABC, NBC and CBS invested a huge amount of money in two inch videotape stock to provide shows to Hawaii, and Alaska. I was visiting CBS Television City in Hollywood many years ago and was told that a lot of two inch tapes had been lost between Fairbanks and CBS Hollywood. Well today it's all different. Thanks to technology and those things flying around in space, Anchorage can enjoy "same day" television, just like the lower 48. I guess that's a good thing, but there was something about the old days when we got our television shows two weeks later. and that was alright with us. Now check out Norma Goodman Said What? 4 PM TV Station Sign Off? If I remember correctly, one TV station would sign off about 4 pm, then sign back on at 8 am. Am I close on the times and what station was it? KTVA was the first TV station in Anchorage. 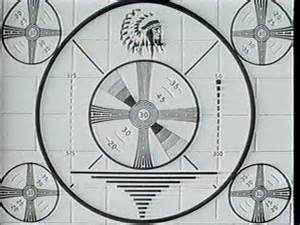 They signed on in December 1953 with a limited broadcast schedule from 2:00pm to 11:30pm. We brought a TV and generator to our fishing cabin at Moose point to watch the Moon Landing. And having color TV was very exciting, especially for the children. Thanks for all the info that we were not aware of and you all did a remarkable job. I remember manning the controls for Ruth Briggs at KENI Radio while Ruth broadcast from the large live studio in the 4th Avenue Theater. Of course there were days when even Ruth couldn't mush her way into Anchorage all the way from Eagle River. Memories too of Ruben Gaines and Ed Stevens doing the baseball recreation play by play on KBYR long before there were any live radio network feeds let alone TV. They had a block of wood hanging from the ceiling and tapped it with a small hammer as a sound effect when it came time to hit the ball. Over the years, the engineers included Alaska Broadcast Hall of Famer Charlie Gray. Charlie and Don Porter were miracle workers when it came to putting us on the air from strange places, if you call the roof of the Bun Drive In a strange place, or doing snow machine race reports from somewhere North of Nenana. I was just telling someone a few days ago, about getting things (including TV programs from out-of-state) late in Alaska, until I was a young woman with a couple of kids, myself. I was living in Soldotna, pregnant with my second child, when the moon landing was transmitted live. What a HUGE deal that was, and how exciting for us all. I saved some news clippings from the moon landing coverage in 1969. It featured KENI chief engineer Charlie Gray. I was almost 13 and who would have thought that I would be working for him a decade later. I was fortunate enough to run the first official "same day delay" program on KTUU in 1984. (I think that was the year.) Great memories. I knew Charlie Gray and worked with him for a while at KENI-TV (now KTUU). Charlie brought color television to Anchorage with the installation of a color "film chain" so they could broadcast color 16mm film and slides. Then he brought color video tape to Anchorage. Charlie also had to be an innovator every year when KENI-TV put together coverage of each year's Fur Rendezvous parade and Dog Sled Races.